As much as you want to trust your judgement while you are interviewing employment candidates, knowing how to run a background check on employees is a must when you own a business. No matter how intuitive you are, it is very difficult to sense whether or not someone have a history of violence, theft, or irresponsible decisions. Hiring the wrong employee who has a criminal past can not just put your staff at risk, it can put your entire business at risk. This is why background checks on new hires and routine screenings throughout employment are two human resources tasks that are becoming popular in small and large organizations alike. If you own a new business or you have an older business and you are ready to screen your employees, you might be wondering how you can go about running background checks. The process is not extremely difficult, especially if you have a smaller workforce or a dedicated human resources specialist that is responsible for these types of duties. Read on, and learn what you need to know to protect your business while staying in compliance with employment laws. Violating employment laws can get expensive. This is why you need to know what the law is governing the background checks you can run and what you can consider when you are hiring in your state. There are both federal laws and state laws that you need to familiarize yourself with. In all states, you can use an applicants credit history in your decision making as long as you get written consent before you run the report. According to the Small Business Administration, the criminal history laws vary from state to state. In most states you are limited in what you can consider or how far you can look back. Because of this, you should consult with a lawyer practicing in employment law before you run a criminal history check to decide who to hire. If you have already verified that background checks are legal in your state for employment, you can proceed. Running a credit report is not extremely difficult, but if you want a full background on a potential employee it could be a good idea to work with a private firm. There are several websites designed just for employers that will allow you to enter a person’s personal information that can be found on their application. These tools cost money per search, but you may be able to gain access for the entire year for a flat fee if you want to run multiple checks. 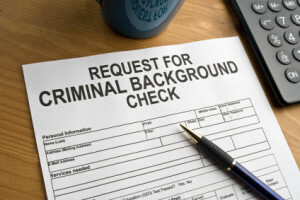 At least seven in 10 organizations use these background screening tools to check criminal history, according to Forbes. Be sure you are thorough and you are consistent so that you can avoid hiring unethical or dishonest people. Running a background check only takes a few minutes in today’s technologically advanced time. As long as you comply with the laws and you draft documents so that applicants can give their consent, you should be in the clear. If you have questions, consult a lawyer. Once you have done this, decide which firm to run the screenings through. It is best to learn how to run a background check on employees directly with the firm so that you know how to use the tool to screen each finalist before they are sent an offer.